I may have started off this post with 3 different sentences and then hit backspace. I know it's been a while and if you want to know how a few of us feel, Rachel, has hit the nail on the head. I've also come to the conclusion that blogging is a seasonal hobby, and it is not to be done when its 85 degrees out, sunny and there are Strawberry Daiquiris to be consumed. 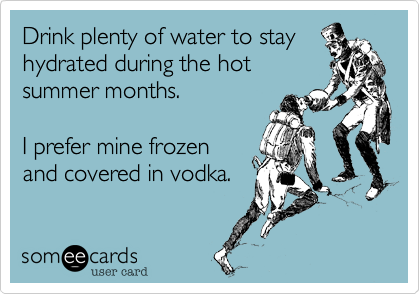 Especially when you only get about 2 1/2 months of this fabulous weather! I'm going to blame those Strawberry Daiquiris on my blogging hiatus and I'm sharing the recipe so you too can have a real excuse for your MIA to the blog world. First, fill your blender to the top with ice and dump the can of strawberry mixer on top. Squish it down with the can. Then fill the can with 1/3 Vodka and 2/3 coconut rum. Pour this slowly in to the top of the blender. Blend on high until all of the ice is crushed and it's moving like a cycloooonnnee. Enjoy and then passout take a nap! *disclaimer. I assure you that she only had a sip and that no dogs were intoxicated for the nature of this post. oh my YUMMM it looks deeeelish!! no dogs intoxicated. loveit hahaha!! mmm these are my fave! Perfect for a hot summer day! HAHA love this! Why don't we live closer to each other?? hahaha that is hilarious and those look YUMMO! Hahaha I want some daiquiris now! My dog will drink them too. That looks amazing! Side note... I had the best watermelon margaritas the other day, I may have to recreate them just for a blog post! YUM! that looks sooooooooo goooood! need to try this asap! Yeah!! You are back! I think I need to make a quick trip down the Cape for some of these! Uhmmmm yes please! Making some of this pronto! The last 2 pics are awesome! Lol! I agree - much harder to find time to blog in summer! !